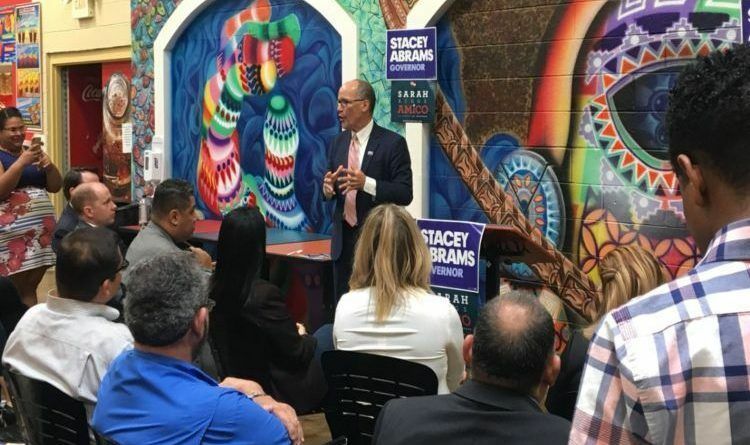 Just months ahead of the 2018 midterm elections, DNC Chairman Tom Perez delivered remarks to liberal supporters at an “indoor Latin mall” in Atlanta, Georgia this week, but as it looks like the event was a blowout. Perez spoke in front of a small group of supporters who wasted their day to attend the event. A video posted of the event shows fewer than w0 people in the room. That’s including Perez. “Michelle Obama always said, ‘When they go low, we go high.’ I have a variant of that. When they go low, we go vote,” said Perez to the nearly empty room. How sad and funny at the same time. Looks like a lot of people have already decided to #walkaway! But, why won’t the Liberal Media report on this?? As the actual American citizen Democrat voters walk away from the Democrats the only remaining voters for them will be the illegal aliens!!! Wake up people and forget the Liberal Media hype and propaganda!!! Under President Trump….America is “Winning” again. So, remember, remember the sixth of November… Vote RED or America is dead!